One of the few Japanese games localized for Western audiences that seems to have been localized correctly is Persona 5 from Atlus. The game has been receiving a lot of positive criticism from most real gamers and a lot of great feedback for bringing the experience to the West without perverting it with ideological nonsense or American localizers attempting to subvert the game with their own personal politics. Well, Kotaku wasn’t too happy about that, and they tried to stir up some hate-bait and controversy by creating needless drama over the game’s localization. Kotaku writer Chris Kohler recently published a piece on April 18th, 2017, attacking the localization of Persona 5 due to a mini-game that appears in the game that maintains its Japanese roots. 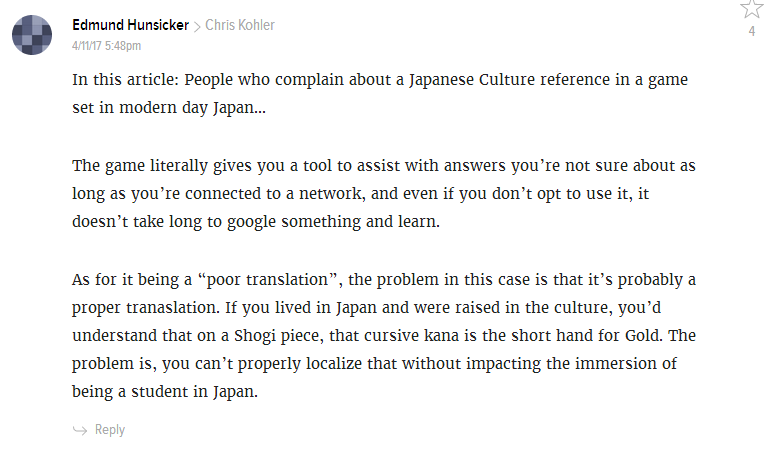 The complaint from both Kotaku, and another 汚い 外人 named Nathaniel Chapman who works as a senior encounter designer on World of Warcraft, claimed that the localization was “bad” and “wrong” because it didn’t reference the symbols properly in the right lexicon and that it should have changed to something Americans would be more familiar with. A video is linked in the tweet to showcase his issues with the localization of Persona 5. Thankfully, real gamers knew what was up. In the Twitter thread some people chastised Chapman for wanting to remove a culturally significant piece of Japanese history from a game about Japanese school kids living in a Japanese city. @pedrothedagger Don’t you dare say it’s bad localization. Stop it. We’ll never get anywhere by REMOVING cultural education from games. Even in the Kotaku piece, there’s plenty of flak from commenters being thrown the way of both Chapman and Kohler for trying to start drama where none needed kindling. In fact, a majority of Kotaku’s commenters seemed to think this was a nontroversy. 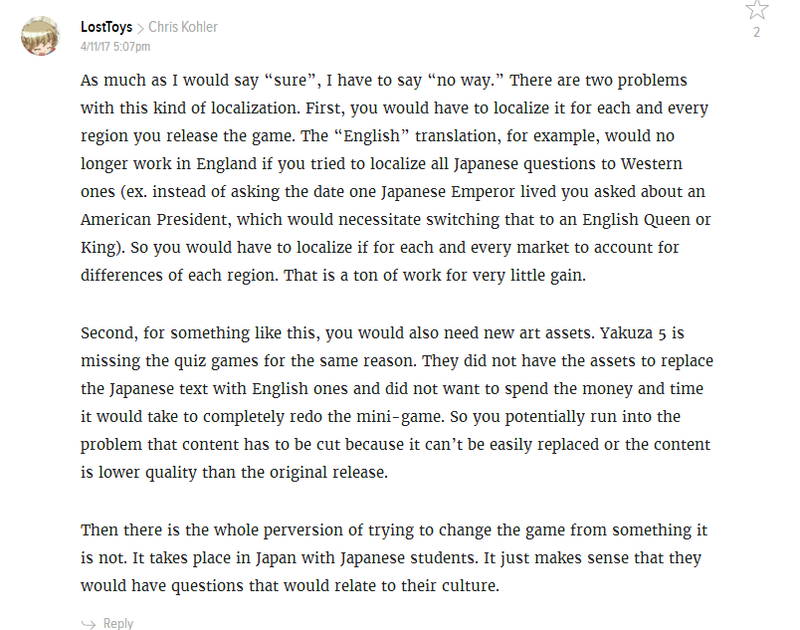 There are some Kotaku fanboys defending Kohler, but majority believe Atlus did right by properly localizing the game. This is something real gamers have been asking for, and they’re thankful for that localization. In fact, the Metacritic user scores also seem to agree with the commenters on the Kotaku page, and the general feedback from the gaming community on Twitch and YouTube also seem to be high up on Persona 5. Kotaku and Chapman doubled-down and began extenuating the situation by attempting to argue about the locution being incorrect. However, a regular supporter of ethics in journalism, a Japanese native who goes by the handle of Mombot — and someone SJWs and Crash Override Network volunteers tried to dox — put together a Medium piece breaking down how the translation is correct and that Kotaku was factually incorrect for attempting to argue otherwise. Mombot goes through the process of delineating the differences in how the Japanese articulate in writing certain phrases and symbols based on the three major styles of their linguistic architecture, and provides ample examples of how the localization in Persona 5 is both accurate and respectful. If the developer says it’s correct, if a Japanese native says it’s correct, if other players are fine with the inclusion because they feel it correctly portrays the culture in the way that it was intended – as opposed to bastardized localizations like Tokyo Mirage Sessions: #FE or Fire Emblem: Fates – then why are journalists saying otherwise? Thankfully, gamers are able to see through the hate-bait ruse and hopefully Atlus appreciates the love real gamers are showing them for a proper Western localization of Persona 5.